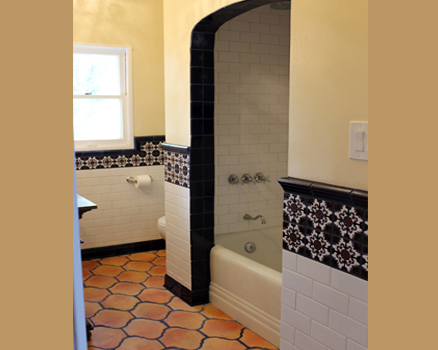 Remodel of family bathroom in a Spanish house, Santa Ana, California. This typical hall bath bathroom in a 1937 Spanish home needed help. The bones were good but it could use a face lift. The homeowners asked me to design a makeover without moving walls or anything. We created a charming and colorful room using classic Spanish components. The walls are a combination of a royal blue chair rail mounding on top of a decorative blue & brown pattern tile. These three rows of square tiles add a colorful band that is the backsplash for the vanity, and continues around the room. The white subway tile is the field tile above the royal blue cove base. The classic Sausalito tile flooring is accented with royal blue grout to compliment the wall tiles. The shower arch is accented with the royal blue tiles. The focal wall in the shower has a framed area of the same blue & brown deco tile. The new chrome shower fixtures add a little sparkle to the alcove. The wood vanity is topped with Caesarstone to blend with the brown tones in the deco tile backsplash. The chrome framed mirror completes the vanity vignette. The old world ceiling fixtures complete the makeover, adding sparkle and charm to this family bathroom.